The wife and neighbour of John Paintsil have both withdrawn complaints against the Ghana international in relation to a domestic incident on Friday. The former West Ham and Fulham defender, 31, was arrested on Friday on charges of assaulting his wife and threatening his neighbour. The Black Star was released on bail hours later and is expected to rejoin his club in Israel later this week. He was taken to hospital on Tuesday to treat exhaustion and dehydration. 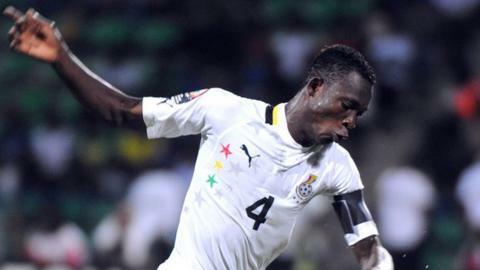 The right-back received medical care at an Accra hospital before being released to continue with his recovery at home. "The past five days have taken a severe emotional toll on the Paintsil family," said a statement released through the Ghanaian FA on Tuesday. "And that toll manifested itself in the unfortunate incident this morning." After he was detained on Friday, Ghanaian police originally stated that Paintsil had stabbed his wife in the upper eyelid - although this claim has since been retracted. With the local police having also decided not to pursue a criminal case against the footballer, a man who has captained Ghana in the past will now be able to return to Hapoel Tel Aviv, the club he plays for in Israel. Paintsil's wife Richlove, meanwhile, has been released from hospital. Earlier this month, Paintsil - who represented Ghana at both the 2006 and 2010 World Cups - was part of the team that finished fourth at the Africa Cup of Nations in South Africa.